Simon & Schuster, 9780684831688, 1056pp. Fifteen years in the making, the first volume of the full-scale astonishing life of one of our greatest screen actresses whose career in pictures spanned four decades beginning with the coming of sound—the first to delve deeply into Stanwyck’s rich, complex life and to explore her extraordinary range of eighty-eight motion pictures, many of them iconic; her work, her world, her Hollywood through an American century. Frank Capra called her “The greatest emotional actress the screen has yet known.” She was one of its most natural, timeless, and underrated stars. Now, Victoria Wilson gives us the first full-scale life of Barbara Stanwyck, whose astonishing career in movies (eighty-eight in all) spanned four decades beginning with the coming of sound, and lasted in television from its infancy in the 1950s through the 1980s—a book that delves deeply into her rich, complex life and explores her extraordinary range of motion pictures, many of them iconic. Here is her work, her world, her Hollywood. We see the quintessential Brooklyn girl whose family was in fact of old New England stock . . . her years in New York as a dancer and Broadway star . . . her fraught mar­riage to Frank Fay, Broadway genius, who influenced a generation of actors and comedians (among them, Jack Benny and Stanwyck herself ) . . . the adoption of a son, embattled from the outset; her partnership with the “unfunny” Marx brother, Zeppo, crucial in shaping the direction of her work, and who, together with his wife, formed a trio that created one of the finest horse-breeding farms in the west; her fairy-tale romance and marriage to the younger Robert Taylor, America’s most sought-after— and beautiful—male star. Here is the shaping of her career with many of Hol­lywood’s most important directors: among them, Frank Capra, “Wild Bill” William Wellman (“When you get beauty and brains together,” he said, “there’s no stopping the lucky girl who possesses them. The best example I can think of is Barbara”), King Vidor, Cecil B. De Mille, and Preston Sturges, all set against the times—the Depression, the New Deal, the rise of the unions, the advent of World War II—and a fast-changing, coming-of-age motion picture industry. And here is Stanwyck’s evolution as an actress in the pictures she made from 1929 through the summer of 1940, where Volume One ends—from her first starring movie, The Locked Door (“An all-time low,” she said. “By then I was certain that Hollywood and I had nothing in common”); and Ladies of Leisure, the first of her six-picture collaboration with Frank Capra (“He sensed things that you were trying to keep hidden from people. He knew. He just knew”), to the scorching Baby Face, and the height of her screen perfection, beginning with Stella Dallas (“I was scared to death all the time we were making the pic­ture”), from Clifford Odets’s Golden Boy and the epic Union Pacific to the first of her collaborations with Preston Sturges, who wrote Remember the Night, in which she starred. And at the heart of the book, Stanwyck herself—her strengths, her fears, her frailties, her losses and desires; how she made use of the darkness in her soul in her work and kept it at bay in her private life, and finally, her transformation from shunned outsider to one of Holly­wood’s—and America’s—most revered screen actresses. Writing with the full cooperation of Stanwyck’s family and friends, and drawing on more than two hundred interviews with actors, directors, cameramen, screen­writers, costume designers, et al., as well as making use of letters, journals, and private papers, Victoria Wilson has brought this complex artist brilliantly alive. Her book is a revelation of the actor’s life and work. Victoria Wilson is a vice president and senior editor at Alfred Knopf. She grew up on Martha’s Vineyard and lives in New York City and upstate New York. She is at work on the concluding volume of A Life of Barbara Stanwyck, 1940–1990. "Victoria Wilson’s monumental Life of Barbara Stanwyck is not only an extraordinarily well researched and documented biography of a great star actress from the Golden Age of Hollywood, it is also a vivid portrait of the entire era in which she flourished. 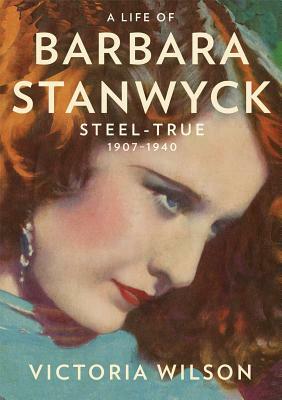 Her films and her private life are both chronicled in great detail in this excellently written work, the first of a two-volume labor of love that will surely stand as definitive on an important subject, Stanwyck being perhaps the most modern of all female screen stars." "If ever there was an actress who was ready for prime time, it is Stanwyck, and this enormously informative tribute -- juicy, yet dignified, admiring yet detached – is the book to bring her to center stage." I had a great time reading about Miss Stanwyck. . .what a fabulous endeavor. I marveled at the work involved. You gave me a terrific read, and I thank you sincerely. "Wilson gives us an appropriately large, thrilling, and sensitive biography to go with this staggering career. . . . What she discovered—and shares in this indelible, revelatory book—is an artist's extraordinary transformation from homeless child to one of the most magnetic stars in the history of Hollywood." "I was blown away, absorbed, riveted. What great smooth style, what brilliance, what depth. I collect celebrity biographies and this one is transcendent. This is huge and wonderful and rich. What an achievement!" “I am loving your Barbara Stanwyck--you bring that whole period of time so brilliantly to life. I am already in love with her and so so angry at Frank Fay! Thank you for this wonderful, delicious book!"